All eyes are on Bhutan now that William and Kate, the Duke and Duchess of Cambridge, are to visit this little known Himalayan Kingdom in the spring. 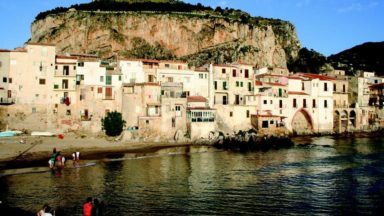 Isolated from the world until the 1950s and only open to foreigners from 1974, it has retained its rich cultural heritage, making it a fascinating place to visit. So, fancy making like royalty and giving Bhutan a try? 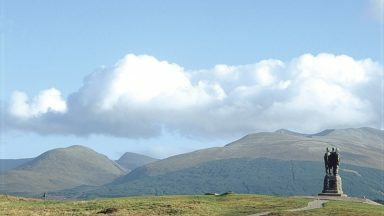 We believe it fully deserves to become a more popular destination for walkers and trekkers. 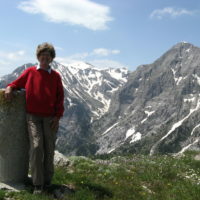 Avid walker Pamela Harris, co-author of Cicerone's books to Walking in Provence, tells us more. Potential visitors should be aware that it is still not possible to just buy an airline ticket and hop on a plane. Flights, visas and hotel accommodation must be organised in advance, either by joining a tour group with one of the many adventure travel agencies, or by contacting a Bhutanese tour company directly. We found that this was the most satisfying way, as the small company that we were recommended (Boonserm Tours and Travels) was extremely efficient, organising everything for us by email yet letting us make our own decisions about where we wanted to go. 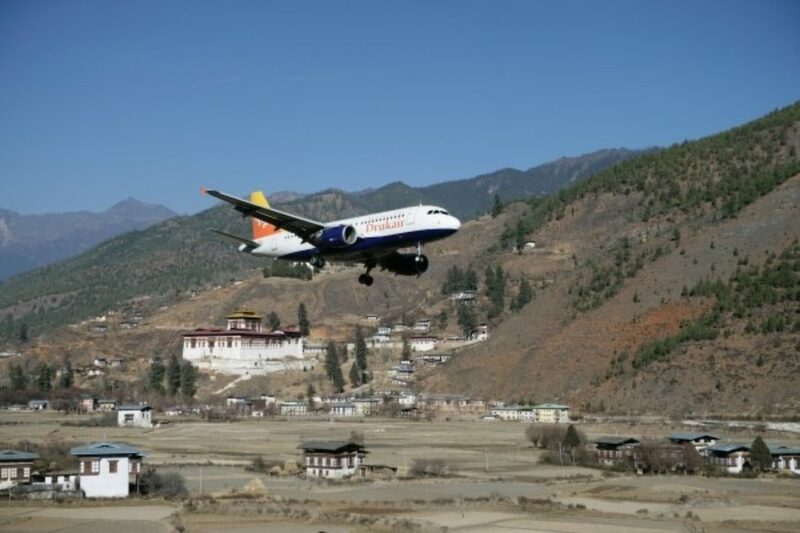 The Drukair flight from Kathmandhu to Paro, the only international airport in Bhutan, must be one of the most spectacular in the world, along the whole chain of the highest Himalayan peaks, including the mighty Everest itself. All too soon the plane spirals down into the narrow Paro valley, and your adventure begins. You feel as though you have been transported back to the Middle Ages yet with modern technology, for the airport building looks like a medieval palace and even the pilot wears national dress. 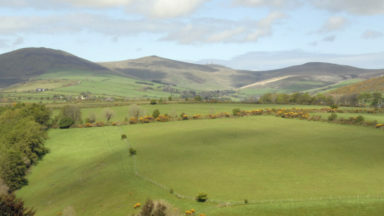 It is this mixture of the traditional and modern that gives the country its special charm. Wander round Paro first, for it is an enchanting small town still guarded by its ancient watchtower and an immense fortress-like dzong. This is the administrative and religious centre, with government offices, and a temple and living quarters for the monks. The interior is beautifully carved and decorated, and to visit here everyone wears traditional dress, with a white scarf draped over the shoulder: for men this is a gho, a knee length robe belted at the waist with large white detachable cuffs, and for women a kira, a long patterned skirt with a short jacket, all very elegant. At weekends Paro has an open-air market with local produce displayed on the ground: hard chunks of yak cheese and the many vegetables served in the hotel meals, including strange curly fern fronds and the ubiquitous chillies which, together with red rice, form the country’s national dish – definitely an acquired taste! 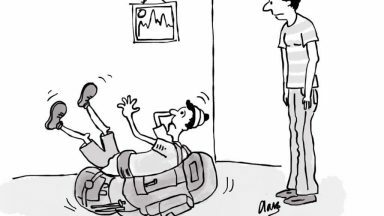 You might see an archery contest taking place - archery is the national sport, and though taken very seriously, is great entertainment. Powerful metal bows fire arrows at enormous speed towards a small target 150 metres away, yet the target is frequently hit; when one team does miss, their opponents delightedly mock them with a derisory song and dance. While staying in Paro, make the effort to climb up to the dramatically situated Tiger’s Nest Monastery, clinging to the side of a sheer cliff 900 metres above the valley. Buddhism is an integral part of people’s lives, and this is where the religion was first brought to the country in 746AD by Guru Rinpoche who flew here on the back of a tigress and chased away the evil spirits. 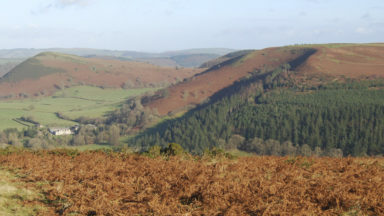 It’s a long three-hour hike uphill, through beautiful rhododendron forest, with tantalising glimpses of the beautifully decorated building high above. 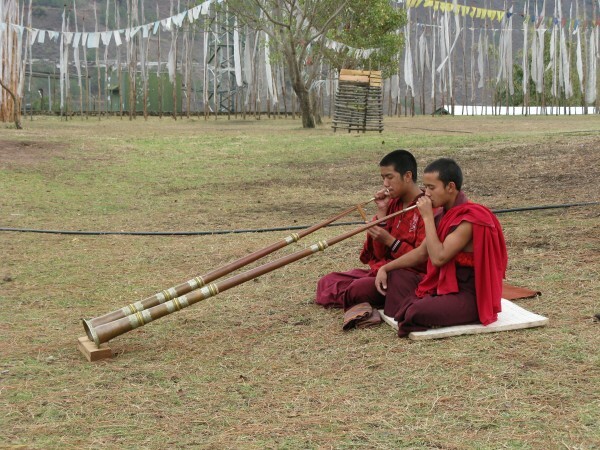 Many families still give one of their young sons to a monastery to be educated and taught music, although if the boys later decide against monastic life, they can leave with no problem. Paro is in the west of the country, and if you travel further east, there are many other fascinating towns to visit, all with temples and monasteries, and spectacular dzongs. 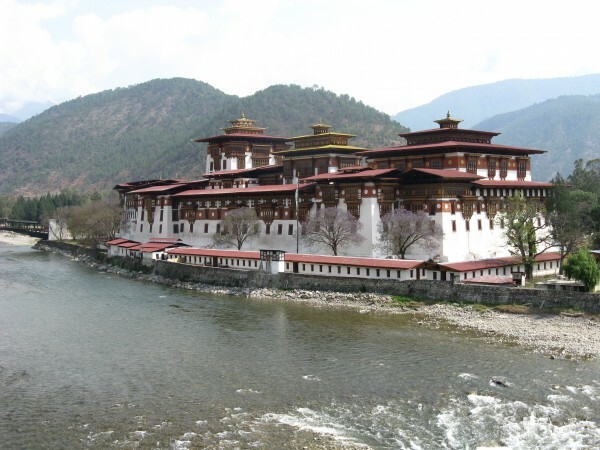 One of the most impressive of these is at Punakha, the original seat of government and capital for 300 years, where the dzong is beautifully situated at the confluence of two rivers. 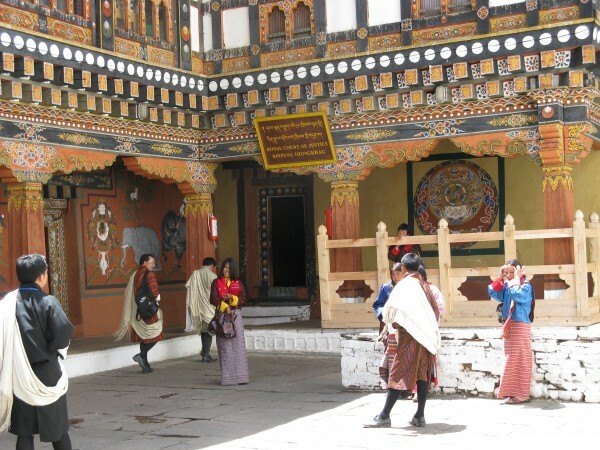 Further east in the beautiful Bumthang Valley are the enormous dzongs at Trongsa and Jakar. If you are lucky you may be visiting one of them at the time of a Tsechu or religious festival. 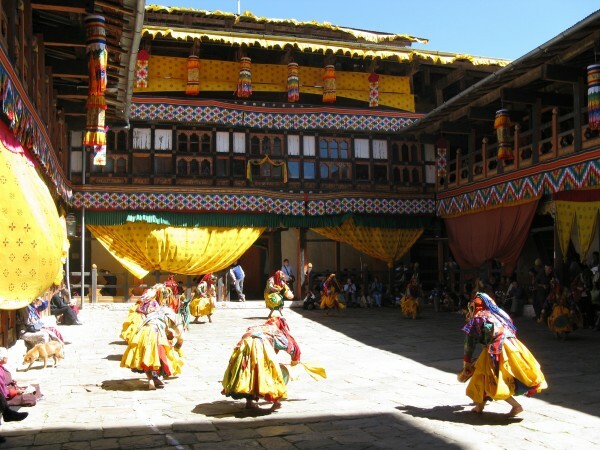 These are spectacular affairs with masked dancers wearing brightly coloured robes and animal or demon-headed masks, whirling faster and faster round the courtyard of the dzong to the spell-binding music of horns, drums and cymbals. The capital Thimphu, where the palace and seat of government are to be found, is no doubt where the royal couple will stay. British diplomats were first invited into the country in the early years of the 20th century, and one of these was Colonel Leslie Weir, Joanna Lumley’s grandfather, who in 1931 came with his family to present an award to the king. 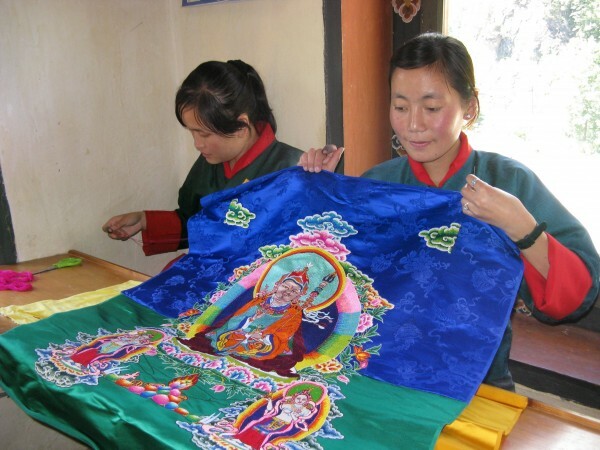 An interesting place to visit near Thimphu is the Choki Traditional Art School, a charitable foundation which gives the disadvantaged students the chance to learn the traditional skills of painting, wood carving, embroidery and weaving, both in order to preserve these as part of the country’s cultural heritage and to enable the students to earn a good living back in their home villages. The mountains are always in sight in Bhutan: with 21 peaks over 7,000m, it is one of the most mountainous countries in the world. 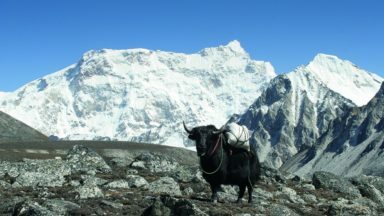 Although mountaineering itself has been banned since 2003, out of deference to the belief that mountain tops are the home of the gods, trekking is popular with tour groups, from the short two day trek into the little visited Haa Valley to the 25 day Lunana Snowman trek, said to be the most challenging trek in the world, crossing ten passes over 4,500 metres. Unlike the busy trails in Nepal, you will meet very few other trekkers here, and the flowers in springtime are spectacular, the hillsides bright with tall rhododendron trees in flower and the campsites covered with gentians and tiny purple primulas. You will come across yaks higher up and birdlife is abundant, a rare species being the black-necked crane which migrates from Tibet to spend the winters in the Phobjikha Valley. 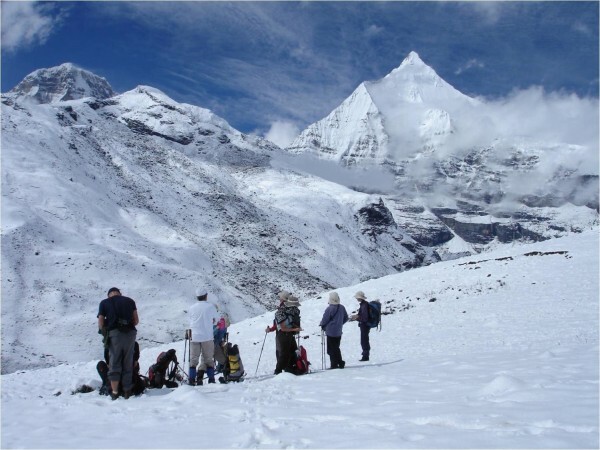 One of the most popular treks is from just outside Paro to Jhomolhari Base Camp, giving spectacular views. 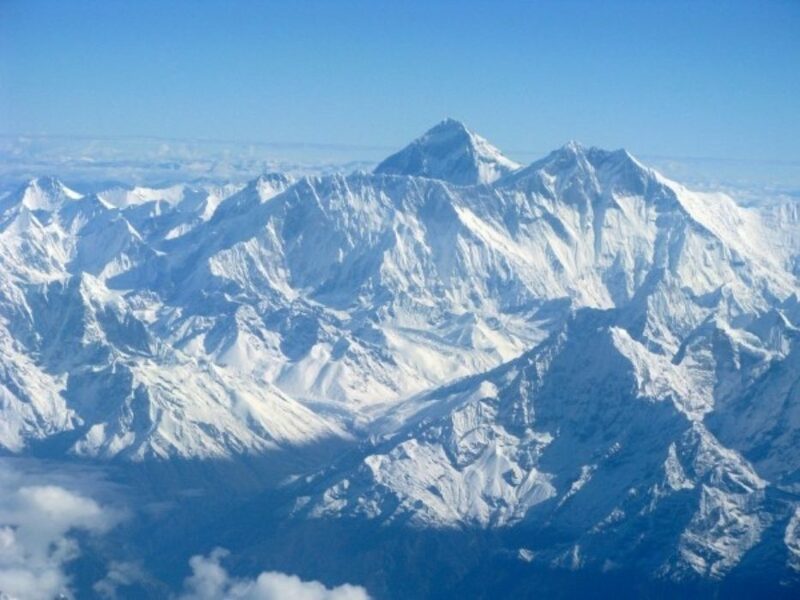 Jhomolhari is the second highest peak in Bhutan, climbed for the first time in 1937 by Spencer Chapman, and then not climbed again until 1970. Have a look at Bart Jordan’s Bhutan: A Trekkers Guide (Cicerone Press) which will give you lots of ideas. But, whatever you do and wherever you go, you will come away feeling as I did, that you have been to a very special place, a true ‘Shangri-La’, and will want to return.